The diploma of higher education – a state-recognized education document certifying the higher education acquired by its holder according to the acquisition of internationally accredited study programme, which meets requirements of the respective level of higher education. Diploma Supplement – a document produced according to the regulations of the European Commission, The Council of Europe, educational, science and culture organisation of the United Nations (UNESCO/ CEPES), which provides objective information and ensures an academic and professional recognition of the corresponding diploma in Latvia and abroad. A description of successfully finished studies, level, context, content and status of the person mentioned in the original of the diploma is included in the diploma supplement. 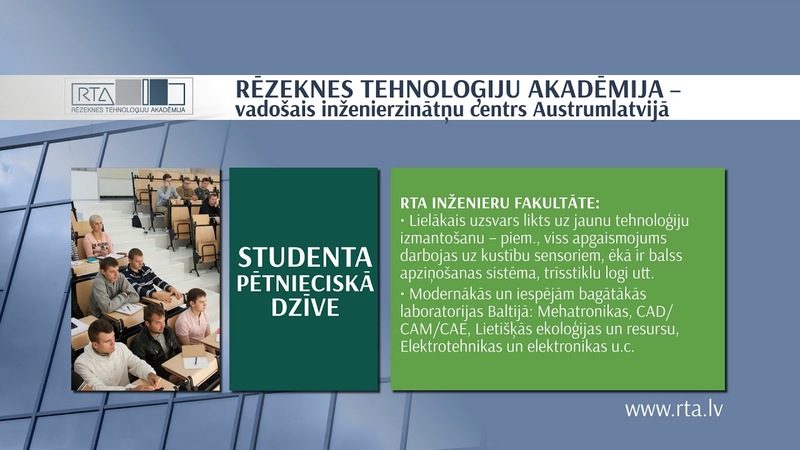 All graduates of Rezekne Academy of Technologies receive their diploma supplements in Latvian and English. Diplomas and diploma supplements are issued to every graduate free of charge. The European recognition label had been awarded to the Diploma Supplements of Rezekne Higher Education Institution (now called Rezekne Academy of Technologies) on 11 July 2009 in Brussels. The necessary documentation is currently being prepared in order to obtain ECTS Label.